I can't say I've ever been very fond of yarn. When I was a girl, my older sister spent hours crocheting incredibly intricate work, and I so envied her ability to make anything she found a pattern for—all while also making it look so easy. I remember her teaching me to crochet a flower one day. I, foolishly, figured that because I was artistic, making a simple flower out of yarn and a hook would be easy-peasy. Well, I learned that day that although I could fill my notebooks with sketches of the Hanson brothers, I could definitely not crochet a flower without it looking seriously deranged. Being a complete perfectionist (and hating failure), I was so upset when my sister ran to show our mom the completed flower. My mom, always the encourager, didn't mention how mine looked like poo compared to the one my sister made. I seem to remember mine even being displayed on the handle of a cabinet in my parents bathroom for quite some time, too. I would give that darn thing the stink-eye every time I was in there brushing my teeth. It was pretty bad. I vowed to never pick up a crochet hook again as long as I lived. When I first moved to California at the ripe old age of nineteen, I spent a lot of time with my grandparents, whom I lived with. (Before I made any local friends, I also attended quite a few bingo nights and lodge meetings, but those are stories for another time.) Both my grandma and aunt are avid knitters, so I begged them to teach me. It somehow seemed less intimidating than crochet, and I immediately became obsessed. I only knew one stitch, but somehow ended up making more than a dozen scarves that first year. At one point, I did even end up crocheting something (a cream colored shug sort-of-a-thing) with the help of my aunt, but in the past several years, I can't say I've done anything at all with either knitting or crochet and have completely forgotten anything I ever learned. I recently found an old stash of yarn and one lone crochet hook I purchased at the dollar store ages ago. (Yep, they sell crochet hooks. Who knew? Man, I love that place.) After being inspired by adorable crocheted items one of my younger sisters sends me, and by one of my favorite crafty ladies, I decided to learn a couple basic stitches and see where it went from there. When Jay came home the other night, I proudly showed him my work of art, and he was all, "Aw, it's a plant cozy." The fact that he knows what a cozy is made me love him a little bit more in that moment. It was much better than the expected, "Why is our tiny plant wearing a sweater?" I almost forgave him for mocking my fluffy scarf from days gone by. In any case, I think it's safe to say I've found a new favorite craft. Crochet makes me feel so zen. I've been mulling over what to do with my shop now that I've reopened it, and I'm still sort of in a weird place. I'm trying to find a direction with it, and perhaps create some new items, or re-vamp some of my favorites. But right now it feels nice to sit back and learn something new—creating something for myself in the process. It's refreshing after making items to sell for so long, you know? 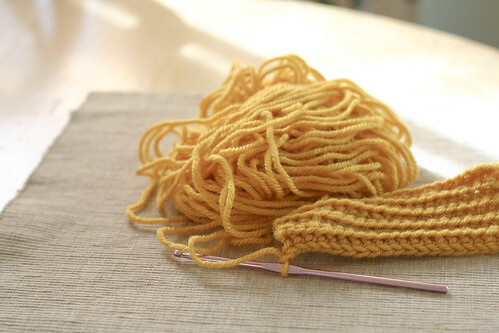 If you need me, I'll be having a love affair with this yellow yarn. Yay! I love crocheting, and there is a large bin of yarn in my office closet giving me the stink eye right now because I've neglected it since November. I enjoy it, but I'm bad at finishing projects! I'm obsessed with that yellow yarn! Can't wait to see what you make with it. Yay! I made myself a scarf and then two hats to give as gifts over Christmas. Right now I am working on a blanket. :) We'll have to get some hot tea and skype and crochet together. Please? Also... what stitch(es) are doing here? Cause, I mean, that looks way cooler than my single and double crochets that seem to pop up in every pattern I find... and that shade of yellow! WHAT BRAND AND COLOR IS THAT?! "Put a cozy on it, I always say. (Actually, I've literally never said that, but maybe now I will.)" That plant cozy is adorable! 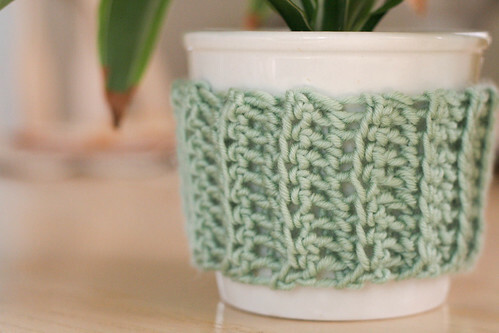 Where did you buy that greenish yarn?? I love that color! you are simply adorable and delightful. so is your plant cozy. Reading your post totally makes me want to learn how to crochet. Also? I love that yellow yarn! Yay! I have also just taken up crochet again! Weirdly, I find knitting SO much more intimidating...maybe I just remember it wrong from when I was a little girl with my Gran trying to teach me. The yarn kept slipping off the end of the needles and I got far to frustrated. Crochet is zen. I can *almost* do my basic stitches without watching. Almost. YAY!!! You give me hope!!! I've been wanting to crochet for so long and while I practice, I can't do more than a chain. *grumble* I DID however make a CIRCLE the other day and was stoked. I showed Jen and she praised me like crazy. <3 I love the plant cozy, teehee!!! Yay! Another one in the gang! I completely understand how you feel. Growing up, I was always clumsy and the only things I could do with my hands was write but I picked up crochet and knitting pretty fast and easy, to my surprise. Crochet has even helped me keep a steady hand when I draw. So cute! I applaud you--I don't have the patience for anything yarn related. 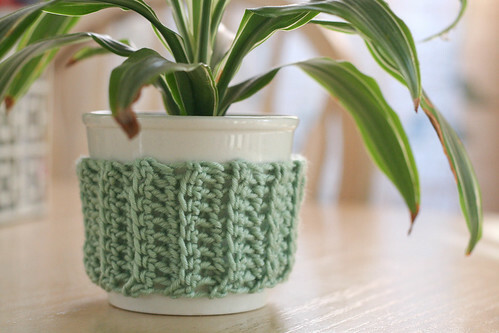 Such a pretty plant cozy :) Learning to crochet is on my list of Craft Projects to Undertake - along with knitting. I can make hats on a loom but that's pretty boring! Just read your bio on Crescendoh....could have been me writing it... I too want to be an artist when I grow up...I'm now 60 so I better get a move on! That looks lovely! I love those colours of yarn. I'm starting to knit more now that I spend more time at home, but I'm still stuck in winter colours. Your yarn makes me feel like spring is around the corner. Kerri, I've also recently discovered crocheting. I learned knitting first (Google taught me) and it was easy enough to learn. Then I picked up the crochet hook and could NOT get the hang of it. But eventually I did, and I like it better than knitting. It's hard for me to handle all those needles!